High & Dry Waterbeds have been supplying waterbed mattresses to trade and retail customers in the UK since 1988, twenty three years so far. Specialist retailers were our main source of revenue but the internet seems to be changing that. Nearly everyone has access to the internet now days and with a little common sense and a little research consumers are able to cut out the middle man. What we are finding is that trade customers that had a waterbed shop years ago found that profit margins have become far lower than those of conventional pocket spring mattresses. As a specialist shop will only sell enough waterbeds to break even at best, many have opted to quit their shops and set up an online retail business trading from home. And who is to blame them? Here is the problem. Because one retailers photograph of a waterbed mattress is much the same as anyone else’s photograph, the retailer that gets the order is generaly the one with the lowest price. So how can they sell a waterbed mattress at such a low price? Simple, just sell a cheaper quality. When they had their shop and relied on customer feedback, they would never have dreamed of selling low cost waterbed mattresses because they relied on customer recommendation. The internet is a fantastic tool, but without doubt it has cheapened many products, not just waterbeds. On the other hand, retailers that charge extortionately high prices simply because they can due to lack of competition and perceived exclusivity will soon be found out. To satisfy both markets of low priced budget waterbed mattresses and high quality mattresses, High & Dry have settled on a simple formula. 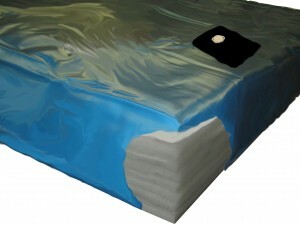 We have created a new waterbed mattress web page. For our own retail customers we will give both options. Visiting our mattress page select if yours is a hard side or a soft side mattress to be. Illustrations on the page show how the layers of fiber dampen the movement of the mattress. Our youtube video is a helpful guide although it is not a Hollywood production. http://www.youtube.com/watch?v=zU8qmceyzaw visitors then have a choice of which quality waterbed mattress they should buy. It would be easy for me to say “Pick the good one” and although it is a far higher quality waterbed mattress than the budget range, it’s not my money to spend. However much I know it is a false economy, many customers just can not comes up with the extra £50. Writing this article has got me reminiscing to the good old days of working in California (stick to the story). Cheap mattresses were available from a hand full of distributors that were buying in from China But only the cheap wholesale stores sold them. History is repeating it self except there are very few retail shops left. This entry was posted on Friday, May 6th, 2011 at 10:16 pm	and is filed under Waterbed Accessories, Waterbeds. You can follow any responses to this entry through the RSS 2.0 feed. You can leave a response, or trackback from your own site.